Cacciatore means "hunter" in Italian. In the classic dish, it refers to a meal prepared "hunter-style" with onions, herbs, tomatoes, peppers, and wine. This version comes together with hardly any effort thanks to the use of an electric pressure cooker. In fact, it is ready to serve in 40 minutes! Using bone-in and skin-on chicken thighs not only imparts decadent flavor into the dish, it also offers a rustic-style presentation that is ideal for this quintessential Italian recipe. When selecting a dry white wine to use in and serve with this dish, try an Italian pinot grigio or cortese di gavi. Capers are the dark green buds which are sun-dried and then packed in a vinegar brine. They impart delicate texture and piquant flavor to any dish. They can be found in the grocery store near the pickles, olives and other condiments. Capers are generally packed in brine, but can also be found salted and sold in bulk. Per Serving: 254 calories; 12g fat; 14.9g carbohydrates; 19g protein; 84mg cholesterol; 1550mg sodium. I have never been good with Italian dishes. I struggle with them. Pressure cooker made me think it might be hard to mess it up & I think I was right. Turned out great! Used fresh oregano & a FAT pinch of red pepper flakes. Also finished with fresh grated Pecorino-Romano as everything is better with a little cheese. Got a mealthy pressure cooker for Christmas and this was my third recipe with it! I actually used boneless skinless chicken breasts so I followed the quick cooking guide that comes with the multipot and cooked this for 10 minutes. It was perfect. Chicken was sooo juicy and tender. This is soo amazing!!! Love it and my new pressure cooker! I used chicken breasts to make this recipe instead of thighs, because that's what I had on hand. All in all this recipe was very delicious. I added a little freshly grated parmesan on top too, so good. If you don't have a pressure cooker, this is one reason why you need to get one now! 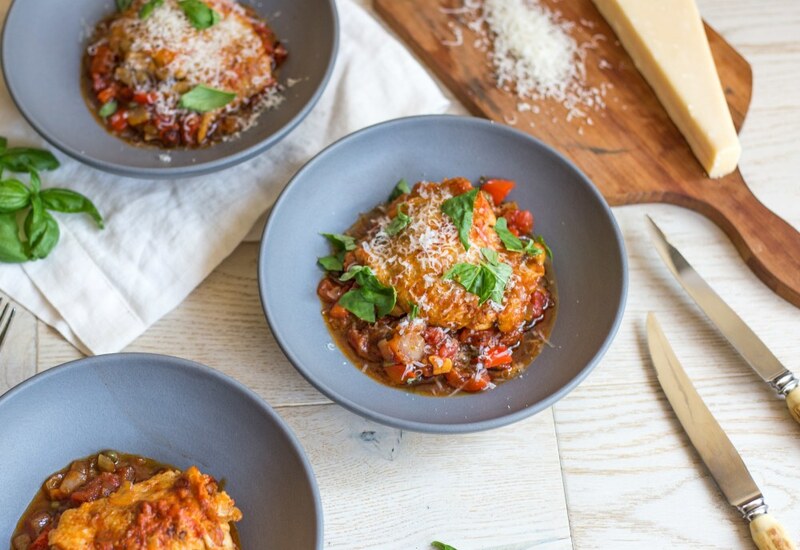 This chicken cacciatore dish is great for date nights and intimate dinners. It's an easy recipe, but will have you feeling like a gourmet chef when you're finished. Whole family loved this, it was so easy with the pressure cooker. Husband hates capers so I emitted. I just got a pressure cooker for a present and am loving it, it makes meals so easy. I was so glad to find so many recipes here. I've made chicken cacciatore before, but it was so time consuming! This recipe was a perfect meal for my family, we even had a little leftover. This is definitely a repeat for weeknights! Loved this recipe. I made it last night. I did use boneless skinless chicken breast and adjusted the time on the pressure cooker. I was amazed at how good it smelled while it released the pressure. This is a flavorful dish. I did not use as much garlic because of my family members but I put in extra red pepper. I served it over thin spaghetti noodles and it lightened this dish up. Like this recipe. I used Boneless skinless breast. At the cook time of 40 minutes I checked the meat and wanted it more tender. I added another 40 min which was sufficient. I love that the outcome was delicious and I did not have to slave half a day as in previous recipes on the stove top. Made this with 3 mostly frozen chicken breasts for 12 min. I sautéd the chicken and vegetables per recipe and only used 1 -14oz diced tomatoes and added some v8 juice. It was amazing!! Def will make again for a quick dinner. Flavor was a 4.5 to 5 star. I didn’t give it five stars because I thought the liquid/sauce was too watery/thin. I made a side of pasta and opened a small can of red sauce to pour on my pasta then I topped with the chicken and veggies through a slotted spoon since the sauce was too watery. This was my second recipe I made after my Mealthy arrived and it was fantastic! I don’t like capers, so I omitted those, only did 14 oz of tomatoes because that’s all I had on hand, so I added a chopped carrot and a chopped celery stalk instead. I also increased the cook time to 17 min and increased the wine. Once done cooking, I added some uncooked thin spaghetti noodles and cooked again for 3 min. It was amazing!!! A new family favorite that we’ll be making weekly for sure!